In early 2016, Denver Botanic Gardens was designated as the seventh Western Region ACS Reference Garden. Although conifers are found throughout almost all of the gardens at DBG, either integrated into the design or acting as a backdrop, there are several collections of particular interest. 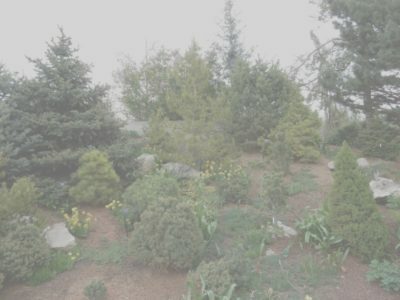 The Dwarf Conifer Collection, the Japanese Garden, and the Rock Alpine Garden all contain unique conifers or unique forms, whereas the Western Panoramas, Gates Montane Garden, and the Mt. Goliath site display conifers native to the various ecosystems of Colorado in more naturalistic settings. 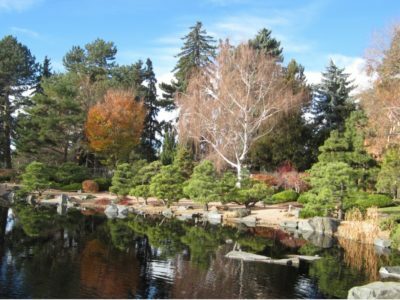 Only a handful of conifers were available from nurseries in the Denver area until the 1980’s, and so gardens contained only a few species, mostly seed grown, and planted again and again. 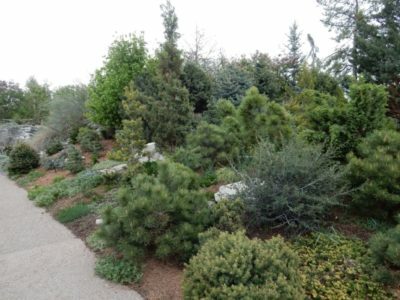 It took the dedication of a very few local plantspeople and the creation of the Rock Alpine Garden at Denver Botanic Gardens (DBG) in 1980 to popularize a wider diversity of conifers among local gardeners. The collection of dwarf conifers at DBG has now expanded to be the largest such collection between the Sierra Cascade crest and the Midwest. Overall, DBG currently has six families, 20 genera and 122 species, 402 taxa, 790 accessions, and 1820 living plant locations of conifers within its various gardens. This represents an astronomic expansion compared to the impoverished number of conifer flora that was once grown in regional gardens! 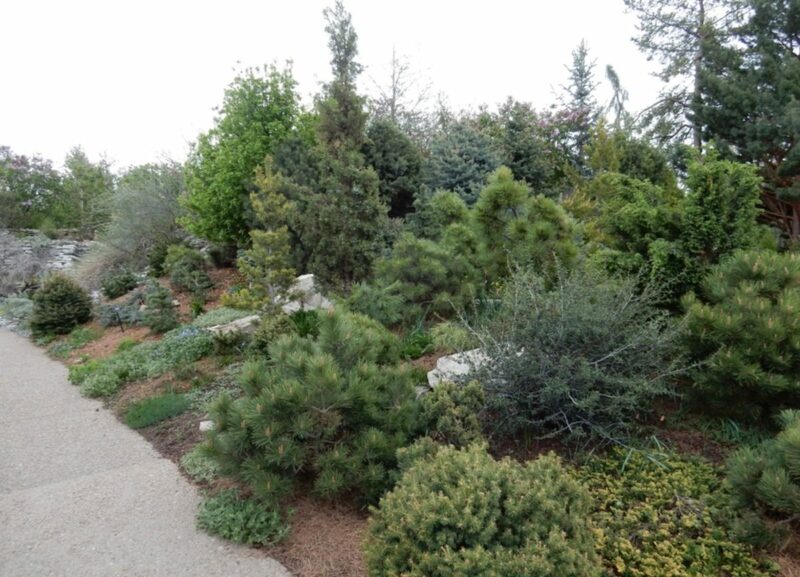 The Dwarf Conifer Collection features most of the dwarf conifers at Denver Botanic Gardens. The internationally renowned conifer enthusiast, Jerry Morris, donated most of the specimens in this collection, and consequently, this is the largest collection of Morris’s conifers in the world. Morris harvested scion and seed from brooms throughout the Rocky Mountains for almost 50 years and introduced many dwarf varieties of native Colorado species with highly unusual and desirable mutations. Exclusive selections of Picea pungens, Pinus ponderosa,and Pinus aristatadominate the collection. DBG leverages the unique and variable traits of dwarf conifers through interpretation and education, holding valuable discussions about plant diversity and genetics around these visually stunning plants. The Japanese Garden introduces visitors to traditional Japanese philosophy and culture through a Japanese garden designed for the Rocky Mountain Region. The name of the garden, ShoFu-En represents “garden of pines and wind.” The main feature of this garden is the abundant use of beautifully aged native character pines (Pinus ponderosa), trained in the Japanese style. Shofu-En was designed by Koichi Kawana, Professor at the University of California and President of Environmental Design Associates in Los Angeles, California, and opened in 1979. The basic style of this garden is called Chisen-kaiyushiki, which means ‘strolling garden around a lake’. 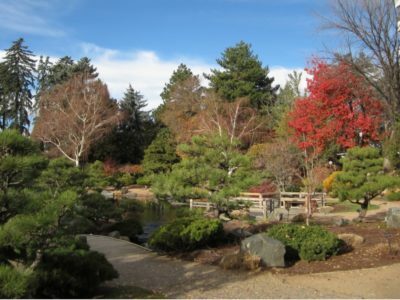 In this garden, Koichi Kawana decided to feature Colorado plants in the classic Japanese style, and with the help of volunteers from the local bonsai club, collected over 100 ponderosa pines (Pinus ponderosa) that were stunted by harsh, windy conditions in Roosevelt National Forest, west of Boulder, Colorado. They transplanted them and trimmed them to look like clouds floating above the surface of the garden. Some of these small trees are more than 400 years old. To keep them small, the candles are snapped off in spring and branches trimmed and tied to preserve their shape. More notable and unique plants are found in the Rock Alpine Garden than perhaps in any other spot at DBG, and they range from champion trees to specimens likely not grown in any other public garden in the U.S. The collection spans species normally not found in steppe climates to those that only thrive in steppe climates. 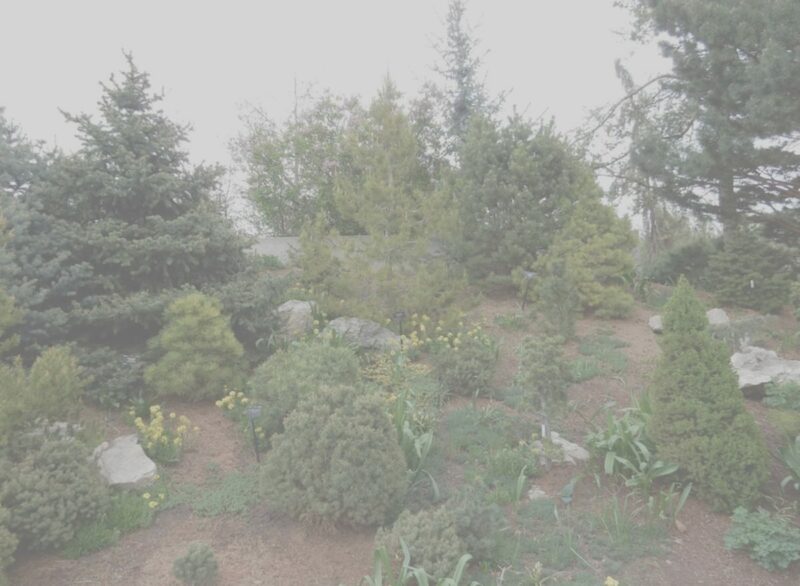 Conifers play an important role in the garden and the Cupressus bakeri, Picea likiangensis, Cupressus nootkatensis‘Pendula’, and Pinus parviflora‘Aizu’ are all state champions. The rock garden holds one of the largest collections of both species and cultivars of conifers at DBG, including many dwarf cultivars. Many of these individuals are over 30 years old and are reaching mature sizes. 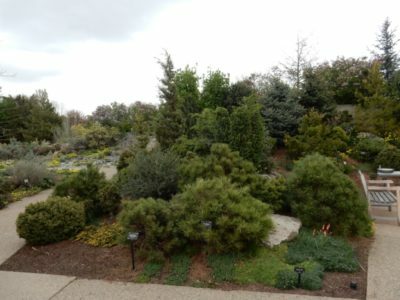 Currently there is a focus on procuring all of the high elevation five-needled pines from the American West, along with several rare Mexican Picea, not normally on display in public gardens. Denver is unusual in its close proximity to many different habitats, including the High Plains/Riparian habitat, the Foothills/Montane/Ponderosa Pine habitat, and the Subalpine/Bristlecone Pine habitat. DBG has created a series of naturalistic gardens that highlight the native flora from each of these regions. This collection of gardens sets DBG apart regionally from other major botanic gardens in North America. The Western Panoramas Garden includes different borders that highlight distinct ecosystems of Colorado and the West. Of interest to conifer lovers are the Ponderosa Border which features many specimens of ponderosa pines that are native to the Foothills/Montane ecosystem, and the Bristlecone Border, which includes many fine examples of this high-altitude pine. This is a satellite site managed by Denver Botanic Gardens and the U.S. Forest Service, is located along the Mt. Evans Scenic Byway at 11,540 feet, climbing from the sub-alpine zone into the tundra at 12,152 feet. Denver Botanic Gardens maintains several naturalized rock gardens at this site, which represent the various plant communities in this alpine and sub-alpine location, including talus, scree, rock crevice, bristlecone pine forest, fellfield, wet meadow, and alpine turf. This site provides the opportunity to experience ancient bristlecone pine forests, with 1600+ year-old bristlecone pines (Pinus aristata) in what is believed to be the second largest bristlecone forest in Colorado. We are pleased to join the American Conifer Society’s Reference Garden program and look forward to welcoming ACS members at our Garden! For more information please call or access our website below.